“SKEEN! is the debut play written by the young writer Tristan Fynn-Aiduenu and directed by the Joanna David Award Winner Ibrahim Shote. 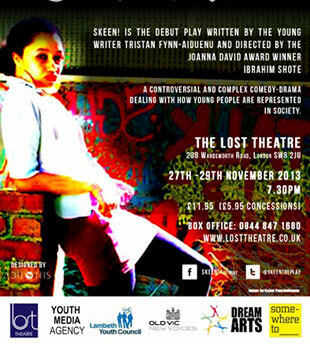 A controversial and complex comedy-drama, dealing with how young people are represented in society. The play cleverly identifies complex issues that arises from the ensuing conflict between the parody of stereotype and wanting to be true to who you are. The talented London based production team are all under 25. The play chronicles the dress rehearsal of several teens who aim to put on an explosive, entertaining end of year production for their Inner City Secondary school. They have decided to go against the bog-standard christmas musical and the director, Astyrian "Ast" Elric, has chosen to adapt an internet novel (or "sket story" in his terms) into the most controversial provocative, ghetto 'n' grime play ever created. The director is pumped, the actors are not ready. The writer is on her way, tonight is the night…all hell is about to break loose!